As we stand on the cusp of the 21st Century we look back over a rich fly fishing history that stretches back over 500 years to a nun named Dame Juliana Berners. While angling historians may find fly fishing methods mentioned further back in the misty past I am content to look no further than The Treatise of Fishing With An Angle published in 1496 to find the roots of modern fly fishing. With her jury of 12 flies, jointed three piece rods, and braided horsehair lines this mysterious lady set the stage for everything that came afterward. After the end of World War II the stage was set for the current modern revolution that has taken fly fishing to heights only dreamed of by past generations, and yet despite how far we have come much of what we practice was discovered centuries ago. A careful search of the angling literature will demonstrate that many of the techniques we consider a modern development were actually in practice many years ago but have disappeared with the passage of time. Fly fishing is a sport that is constantly reinventing itself by rediscovering things from the past. During the 1950's fly fishing fell on hard times. With the invention of monofilament line, fiberglass, and the development of simple and inexpensive spinning reels only a handful of old timers continued to pursue the sport of fly fishing. Only a very few authors were still trying to write about fly fishing, and most of their efforts were mostly ignored by the general angling public, however the renaissance of fly fishing had its beginnings in this period. Among the names of some of these angling authors are Vincent Marinaro, John Atherton, Roderick Haig-Brown, Alvin Grove, Ray Ovington, William Blades, and A.J. McClane, to name just a few. Most of the books they wrote during this period were not given much notice until the late 60's and early 70's, but they laid the ground work for everything that followed. During the 1950's two of the most influential books that were written where Joe Brooks' book The Complete Book of Fly Fishing published in 1956 and Matching The Hatch by Ernest Schweibert in 1955. As important as these two books would prove to be it was the improvements in tackle that truly marked the beginning of the modern fly fishing era. At the end of World War II the gear that the fly angler was using had scarcely changed since the beginning of the century. His fly rod was bamboo; his reel a single action model likely made by Hardy or Pfleuger, his line was silk and carried strange designations like HCH, HDH or GBF. His leader was most likely gut, and over his shoulder he carried a wicker creel that held his lunch and his selection of flies. A good bamboo rod was quite expensive, care had to be taken to make certain that the silk fly lines were carefully dried and properly dressed to protect them from rotting, and in general fly fishing was viewed by the general public as the sport of the wealthy. The implementation of modern materials and mass production soon changed everything. The rise of the fiberglass fly rod was the first step. The first fiberglass fly rods were more suitable for poking bats out of chimneys than as tools for fly fishing but this soon changed. By the mid 1960's it was possible to purchase a fiberglass fly rod that, if not the equal of a fine handcrafted bamboo rod, it was still a quality fly rod. The fiberglass fly rod reached its Zenith in the early 1970's when Russ Peak began to produce his high quality fiberglass rods, and mass produced rods by such rod makers as Fenwick brought excellent fiberglass fly rods within the reach of blue collar workers. In 1973 Fenwick introduced a new fly rod material, Graphite, and with its introduction the modern fly rod was created. Lighter, smaller in diameter, and stronger than fiberglass, by the mid 80's it nearly completely dominated the fly rod market. In the intervening years many rod makers have experimented with other materials like boron, and the modern fly rod is often a combination of graphite, ceramic, boron and fiberglass. Fly lines also made a quantum leap after the end of World War II. Polyvinyl chloride, a synthetic plastic material, was applied over a core of braided nylon to make a plastic coated line. In the early 50's Scientific Anglers developed a method of tapering the plastic coating to make a tapered fly line. In addition, the old system of designating fly lines with a series of letters gave way in the late 50's to a new system that was adopted by the American Fishing Tackle Manufacturers Association. This system was not based on the diameter of the fly line but the weight, in grains, of the first thirty feet of the line. Now fly rods could be manufactured to match specific line weights. With these advancements firmly in place the revolution was set to begin, and in 1971 a book by Carl Richards and Doug Swisher lit the fuse. Selective Trout hit the fly fishing world like a bomb shell. First they gave a detailed description of the major fly hatches of the East and Midwest, and then set out to advance a completely new type of trout fly. By mounting the wings on the side of the fly and using wide spread tails as described by Marinaro, Swisher and Richards blew the lid off the fly fishing world. With the publication of Selective Trout the flood gates were opened for a plethora of new and reprinted angling books. What followed over the next 30 years was nothing short of phenomenal, and the sport of fly fishing would never be the same again. In 1976 an obscure author by the name of Norman MacLean published a novella entitled A River Runs Through It and in 1992 Robert Redford turned it into a full length motion picture. This somewhat romanticized story of a fly fishing family from Montana set the world of fly fishing on fire. Suddenly everyone wanted to become a fly fisher, and in the following years fly fishing became a main stream recreational sport. Perhaps in no other time in the history of the sport had fly fishing received such public acclaim. 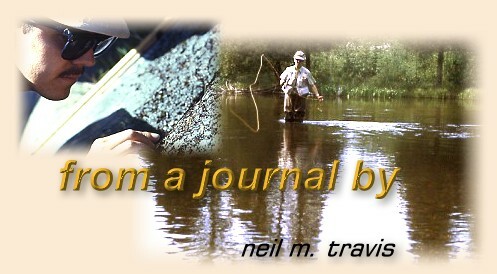 Many of the current practitioners of the sport of fly fishing picked up a fly rod for the first time as a result of this film.